Peter Young's photo was taken on the 16th March 1975, capturing lots of grey masonry and cement, water and sky. Fronds of willow add a fresh green. 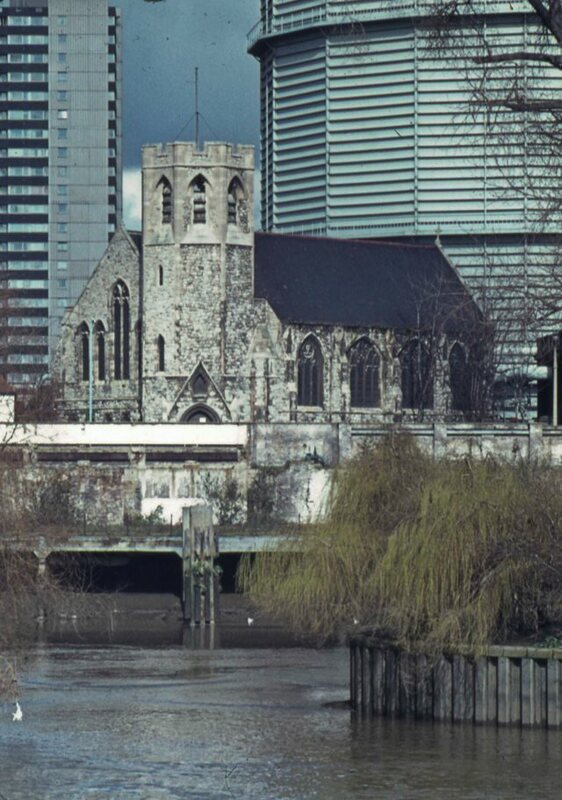 From this angle the church is holding its ground with the gasometer and tower block near but in the background. Their tops are not visible; the church is the only whole building here. A 1960s photo shows the gasometer and church from the High Street and a early 1900s postcard took a more flattering view of the church avoiding any gasometers. The church still stands; it was purchased by IDM in February 2014 and with plans to create '21 units within the already approved envelope of the building, including the Grade II listed Church Hall'. Construction started last year: see the IDM website for more details.